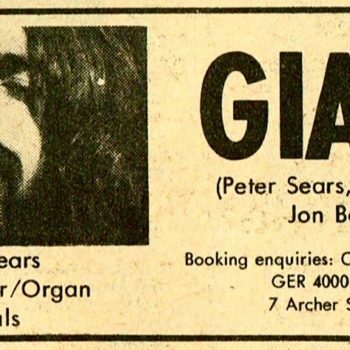 After Vamp broke up I start­ed my own band called “Giant” with Viv Prince on drums…I played lead gui­tar. Viv used to get a pre­scrip­tion for “Tinc­ture of Cannabis” from a Dr. Dun­bar in Earl’s Court. I remem­ber dip­ping our cig­a­rettes in the dark green liq­uid and bak­ing them dry in the oven.